As I discussed in We're Overdue for a Sell-Everything/No-Fed-Rescue Recession, recessions have a proximate cause and a structural cause. The proximate cause is often a spike in energy costs (1973, 1990) or a financial crisis triggered by excesses of speculation and debt (2000 and 2008) or inflation (1980). The cause of the recession of 2019-21 is exhaustion: exhaustion of the pell-mell expansion of credit (i.e. credit exhaustion/saturation), exhaustion in the household and small business sectors as real-world price increases continue exceeding wage and revenue gains, exhaustion of margin expansion in stocks, and exhaustion of Corporate America's policy of masking inflation by reducing quality and quantity: at some point, the toilet paper roll is so visibly diminished (i.e. stealth inflation) that companies can no longer reduce the quantity: at that point, they must raise prices to remain profitable, and this explains the recent surge in the sticker price of consumer staples. 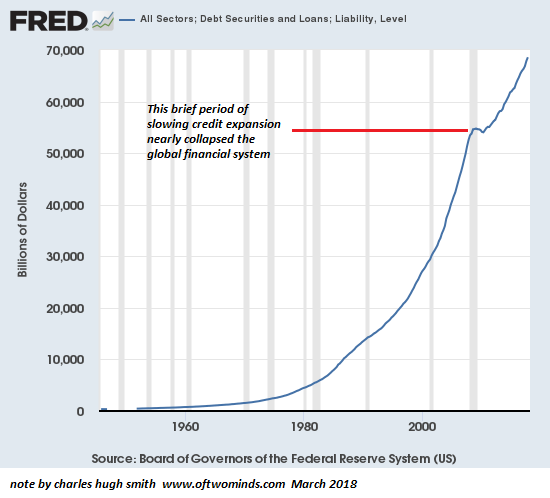 Conventional economics has no answer for exhaustion: the only "solution" in a Keynesian universe is to goose borrowing by lowering interest rates and sluicing limitless liquidity into the financial system. 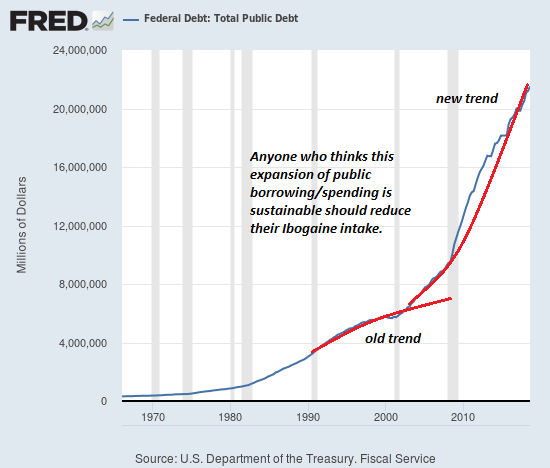 But if everyone who is qualified to borrow more has no interest in borrowing more, lenders turn to unqualified borrowers who will soon default. This sets up a destruction of debt, collateral and wealth that also has no policy answer. The credit impulse doesn't expire, it simply fades away, along with "growth," rising stock markets, higher tax revenues, etc. The second "solution" is to substitute government spending for private spending. But in case nobody noticed, please observe that state/local and federal borrowing and spending has been soaring at insanely unsustainable rates since 2008. Exhaustion overtook the global economy in 2016, but central banks injected massive doses of financial adrenaline to shock the comatose patient. This "solution" continues to this day, as China's central bank reportedly injected an unprecedented $1.2 trillion into credit markets in January alone. That's where the global economy is today. The exhaustion that was taking hold in 2016 was stimulated away by unprecedented injections of monetary stimulus. The response to current massive injections is between tepid and zero. Adding debt to stimulate "growth" no longer works, and injecting the patient with higher doses of stimulus will only cause collapse. The banquet of consequences is now being served, but the good seats have all been taken by those with no debt, unimpaired collateral and little dependence on central bank stimulus or central state legerdemain. All that's left are the bad seats with horrendous consequences for perverse, distorting policies that refused to deal directly with painfully obvious imbalances. Thank you, Spike T. ($150), for your outrageously generous contribution to this site -- I am greatly honored by your steadfast support and readership. Thank you, Dennis G. ($50), for your splendidly generous contribution to this site -- I am greatly honored by your steadfast support and readership.